When planning containers for shady areas of the garden you are compelled to choose plants that will thrive in these conditions. And the plants that are suitable will suggest new and interesting combinations as the fourteen container gardens described below illustrate. 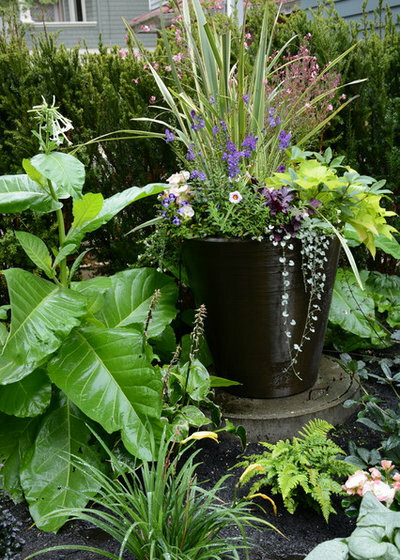 This list of fourteen beautiful planters has been compiled by Lauren Dunec Hoang and comes from the Houzz website. Take advantage of shady spots in the garden to play with a quieter, maybe even more romantic, style of container gardening that works with light and shadow. Create magical ferny vignettes that entice you to slow down and look a little closer. Or, pot up colorful combinations that include shade-loving flowers like begonia or fuchsia — their yellow, orange and pink blooms look all the more vivid against a shadowy backdrop. For inspiration, take a look at these 14 container gardens, all brimming with interesting foliage and flowers, that thrive in conditions from dappled light to full shade. 1. Bountiful blooms. A combination of part-shade-loving coral flowers makes a welcoming statement at the entrance of this home in Portland, Maine. 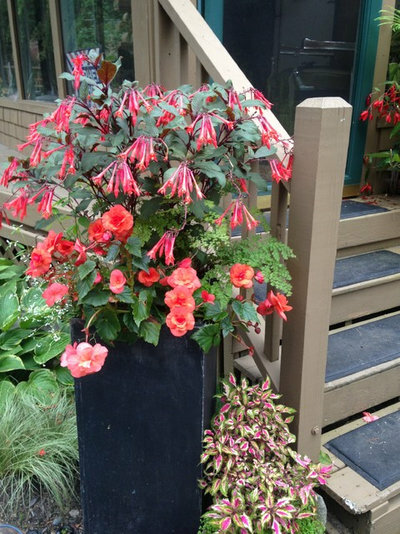 Hummingbirds love the tubular flowers of Fuchsia ‘Gartenmeister Bonstedt’, which bloom from early summer to fall. Orange-pink tuberous begonias and maidenhair fern, with its delicate foliage, fill in the container below. 2. Part-shade stunner. A strappy-leafed New Zealand flax (Phormium sp., USDA zones 8 to 11; find your zone) adds height to this container combination. Although flax is often grown in full sun, you can get away with including one in a part-shade situation as long as the plant receives a few hours of morning or afternoon sun. Other plants in this combination include: plum-colored heuchera (Heuchera sp. ), pale pink gaura (Gaura lindheimeri, Zone 5), lime-green sweet potato vine (Ipomoea batatas, zones 9 to 11), purple flowering angelonia (Angelonia sp. ), hellebore (Helleborus sp., zones 4 to 9) and trailing ‘Silver Falls’ dichondra (Dichondra argentea ‘Silver Falls’, zones 9 to 11).